"THE TWO OF THEM DESERVE EACH OTHER. One's a born liar, the other's convicted." -- New York Yankees Manager Billy Martin, July 24, 1978. Manager, yes, but not for long. At least not in that instance. The subjects of Martin's airport bar alcohol-fueled ire were his star outfielder, Reggie Jackson, and team owner George Steinbrenner. An unholy trinity, a year earlier they'd collaborated to bring the Bronx Bombers their first championship since 1962. The star burnished his Mr. October legend by closing out the series with three consecutive first-pitch homers in its last game. But now, just past the halfway mark of a flagging title defense effort, egos clashed, nerves frayed and tempers boiled over. 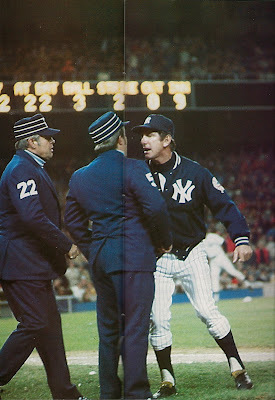 Jackson, mad at Martin for batting him low in the Yankees lineup, ignored his manager's instructions to swing away and bunted into a costly out during an extra-inning game. The Yanks lost that July 17 game to the Kansas City Royals, 9-7, dropping them a season-worst 14 games behind the arch-rival first-place Boston Red Sox. Mr. October was suspended five games for insubordination. Upon his return, the star professed his innocence to the press. That touched off a Martin tirade during which he threatened to bench Jackson indefinitely even if it meant his own dismissal. Hours later, after the Yanks thumped the White Sox, 7-2 in Chicago, the manager offered his fateful unfiltered remarks at an O'Hare International Airport bar before a flight to KC. Four years earlier, Steinbrenner had pleaded guilty to making illegal contributions to President Richard Nixon's '72 reelection campaign and to obstructing justice. Martin, having just stepped on the boss's third rail, was as good as dead. Forty years ago this Tuesday, he tearfully resigned. ... while the low key Guidry went 25-3. Three years earlier, led by gold dust rookies Fred Lynn and Jim Rice, the Olde Towne Team had won the American League pennant then lost an agonizing 7-game World Series to the Cincinnati Reds. While the Big Red Machine rolled over the Yankees in four straight the next year, the Bombers rebounded to win it all in '77, the pendulum now appeared Boston-bound thanks in large part to Rice. The Boston left fielder was on fire. After 96 games, he was batting .322 with 24 homers and 81 runs batted in. He had a .606 slugging percentage and an OPS of .982. Bolstering his presence in the lineup, Lynn, perennial all star catcher Carlton Fisk and aging icon Carl Yastrzemski. 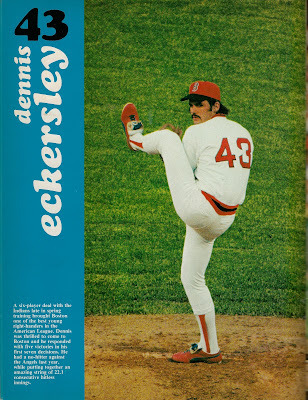 Dennis Eckersley led a starting rotation that included Luis Tiant, Bill "Spaceman" Lee and free agent signee Mike Torrez. 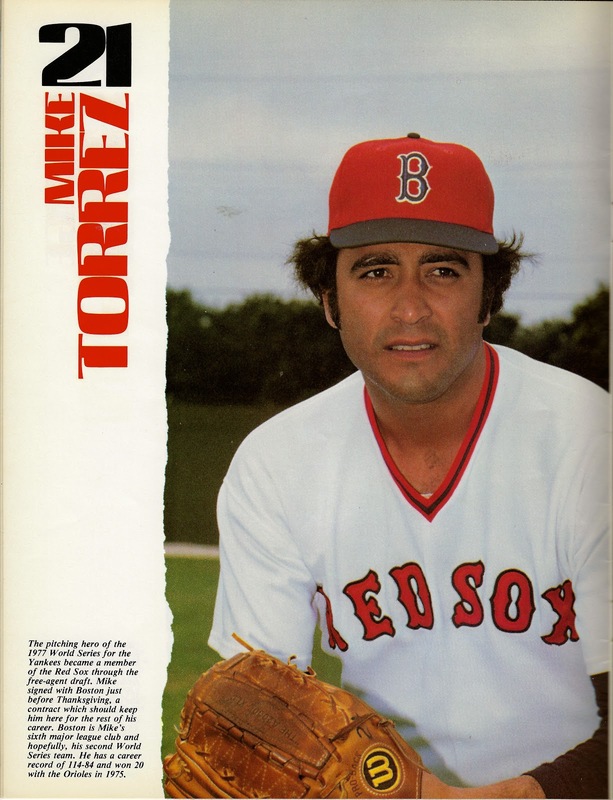 Playing .696 ball -- on pace to win 112 games -- on June 23, the Red Sox fatefully issued a revised 1978 yearbook, swapping out its original cover boy, Fisk, for one celebrating Rice. 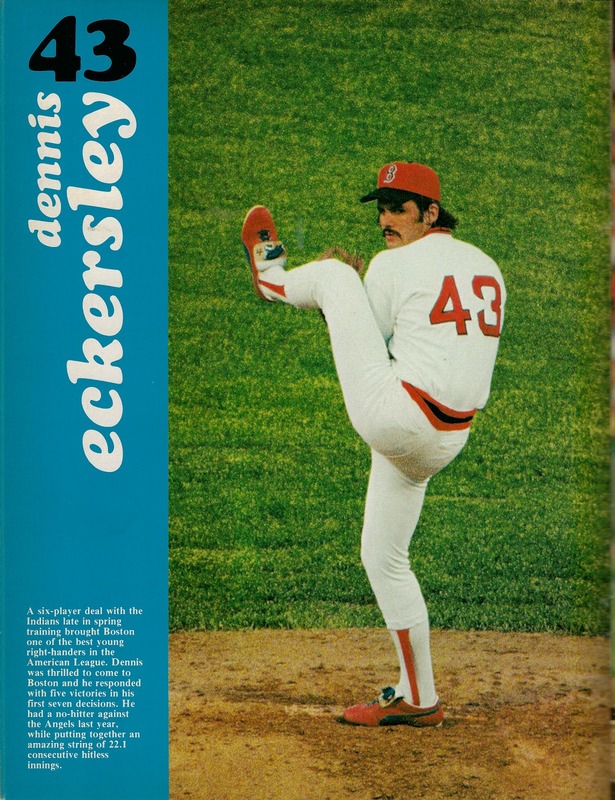 The second-edition Sox won just 51 more games, a .543 clip. The Yankees from that point played at a .627 clip. The race was on. They had replaced Martin with soft spoken Bob Lemon, who'd led the White Sox to a 90-win season in '77, only to be cashiered in early '78 when the South Side Hitmen got off to a bad start. Bill Veeck's loss was the Boss's gain. Steinbrenner had his man. Freed from the Jackson-Martin power struggle, the Bombers reverted to championship form, with one notable exception who far exceeded those expectations. 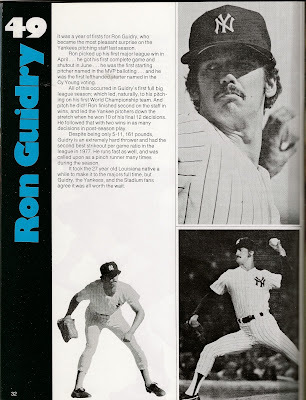 Starter Ron Guidry, who'd gone 16-7 with a 2.82 earned run average and 176 strikeouts in 1977, was now almost unhittable. Amid all the tumult, he'd gone 14-1, with a 2.11 ERA before Martin's departure. He'd finish at 25-3, with a 1.74 ERA and 248 Ks, winning the American League Cy Young Award in a walk and nearly copping league Most Valuable Player honors too. That MVP award went to Mr. Rice of Boston, who'd hit .315 with 46 homers and 139 RBIs. It was no consolation for what ensued after the yearbook was revised, the star suspended, the manager resigned. Sox fans had long been accustomed to seeing their team swoon. Seventy years removed from their last championship, they'd already endured Enos Slaughter's mad dash in '46, Bob Gibson's dominance in '67 and Ed Armbrister's interference in '75. None of that was adequate preparation for what was to come. Swoon not withstanding, Boston enjoyed a nine-game lead over New York as late as Aug. 13. But, by Sept. 10, it was gone. Days later the Red Sox were 3 1/2 back with 15 games to play. Then, led by a pair of future hall-of-famers, Yastrzemski and Eckersley, they rallied while the Yanks faltered. That game was held on Oct. 2 at Fenway Park in Boston. Guidry, with 24 wins on the year, started for New York, while Torrez -- a 16-game winner who'd been a Yankee 12 months earlier -- went for Boston. After six innings, the Red Sox clung to a 2-0 lead on built on a Yastrzemski homer and an run-scoring single by Rice. With one gone in the seventh, Torrez yielded back to back singles, as many as he'd allowed all game. 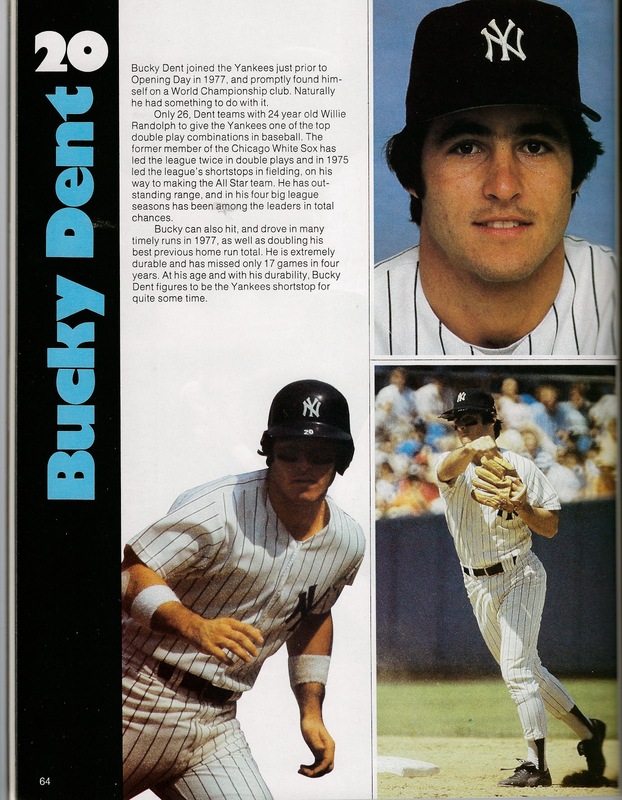 He got pinch-hitter Jim Spencer on a fly to left for the second out, bringing up Yanks' light-hitting, ninth-hitting shortstop Bucky Dent. Dent hammered a 1-0 pitch off his instep, tumbling to the ground in pain, pausing the game and any momentum Torrez might have carried into that moment for a full minute while New York's trainer applied a numbing agent. The shortstop stepped back in the box, choked up on his bat and swatted the next pitch he saw into the screen above Fenway's 37-foot high left field wall for just his fifth homer of the year. It gave the Yankees a lead they'd never relinquish and made him persona non grata in New England forever. * Supplanted as the Yankees' top reliever, when the Yankees signed Goose Gossage, reigning Cy Young Award winner Sparky Lyle poured his ire into a best-selling tell-all about the '78, titled The Bronx Zoo. Last Time the Stars Came Out in Washington D.C.